In this guide, we will quickly provide instructions on how to install a LEMP stack on an Ubuntu 14.04 server on Digital Ocean. The Ubuntu operating system takes care of the first requirement. You can signup for Digital Ocean here and deploy a SSD server in less than a minute. Next, you’ll want to check the web server to see if nginx is up and running. In your Digital Ocean panel grab the IP address of the droplet and enter it in to your browser. If everything went well you’ll see the nginx welcome screen. It’s going to ask for you to create an admin password. Type in a strong password and keep it somewhere safe. These two commands will create the directory structure for MySQL and run a security script to remove some of the defaults and fake user data. You will be prompted for the password that you had created in the previous step. It will also ask you if you want to change your password. You can skip this since you just created a new password. Ok, we’re just about halfway done. We’ve installed the webserver, the database, and now all we’ve got left is to install PHP and WordPress. I promise, this rest will go about as quickly and simply as the first half. What you’re going to edit is the link that contains ‘cgi.fix_pathinfo’. You can scroll through the file or search for the line. You need to uncomment the line by removing the # and the setting the value to 0. Enter a password for the root MySQL user when prompted. Next create a database, you can use any name of your choice, and it’s advisable that you use something other than ‘wordpress‘, but for this example we’ll use it for simplicity. Now we’ve got to create a user for the, again for the sake of simplicity we are going to use ‘wordpressuser’ and ‘password’, but you should absolutely use other values to decrease the chance someone can guess the username and password. That completes the database user creation for WordPress. Copy over the sample config file and rename it. Grant nginx permissions to the directory. 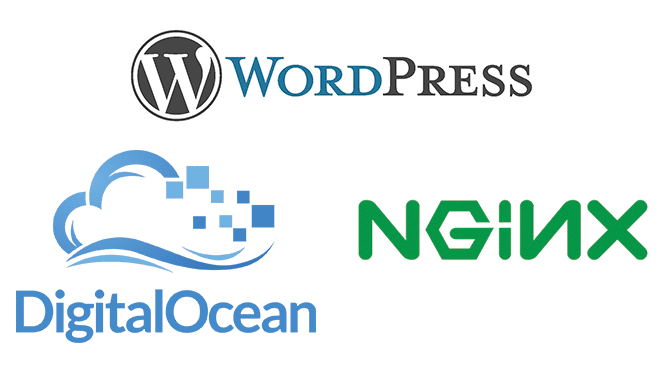 Create the uploads directory and grant access to nginx. Congrats! That’s it’s all you’ve got to do is type in your domain name into a browser and configure the rest of your site. You may want to give this a try. What are are about to do is use sockets instead of TCP/IP. If your on the smallest droplet size running WordPress, your likely running fairly low on RAM. To help with this we can create a swap file that should help keep things running fairly smoothly until your ready to upgrade to a larger droplet size. Save your changes. You’re all done!